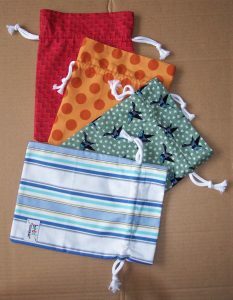 Lizzie contacted the site, purchased 100 labels and the members of the Group volunteered to make up the bags. I signed up for 4 bags and here they are. The bags are quick and easy to make,each takes only 2 x fat quarters of fabric and some cord. I used cord purchased from Franklins, Salisbury and stitched the bags on ‘Pearl’s a Singer’ my darling Featherweight machine. A most productive and enjoyable afternoon.